It takes a little finesse to claim having been too busy these days to pay much attention to the blog while posting about fishing. The key is confidence. If you believe it, you can make others believe it. I hardly had any business taking a day to go fishing. As the day wore on it was clear that a little reshuffle of the priorities for one day was absolutely the right thing. With a fresh mind more gets done in the end. So if you look at a week long cycle of productivity, with a day of fishing mixed in I still managed to get more done. I'm sold anyway. 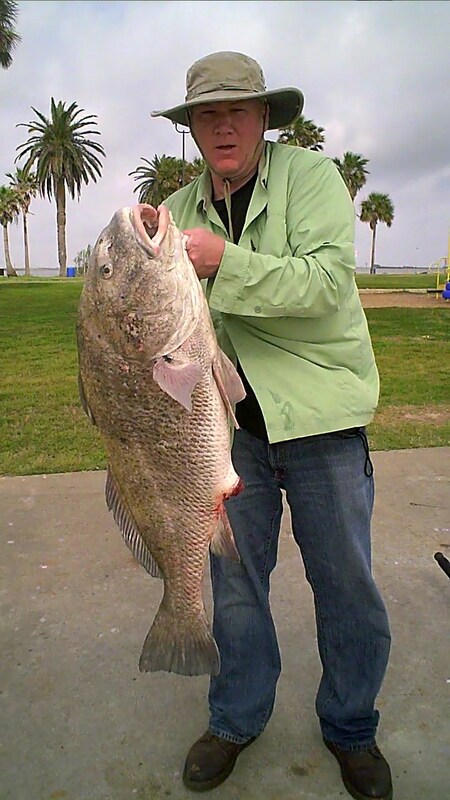 My brother Greg has been doing some fishing in the general Galveston area when he takes a break from being a Chef at Mancuso's Italian Table. Like anything he does, he don't go in there half cocked. Greg educated himself through trial and error, blog research, and by extracting local knowledge from the salty dogs running the banks chasing some fish. All this info Greg is processing on the subtleties of when, how, what and where to do some fishing is producing some results. I know this because, when I sit in my office on a Wednesday afternoon I get a text of some fish just landed on the rocks. Takes a little finesse to send your working brother a fishing report in a text while he's working. Greg seems to have that down pretty good. Greg and I spent much of our lives fishing with Dad. Dad was a passionate skilled fisherman. I could launch into countless stories about Dad's fishing skills and experiences, but that will have to be for another post one day. The need to wet a line can only be denied for so long, so Greg looked up the other morning at 5:00am and found me sitting in his driveway ready to go. Told him he wouldn't need to text me any fishing reports today. The weather held us at bay for the first half of the day almost to point where it looked like a loss, but then somewhere around 1:30pm the skies cleared and the wind settled down. We didn't catch a ton of fish, but we caught a ton of mental balance. After the day was gone I realized that in all our years it was the first time Greg and I hung out, just the two of us, for a day. Just Greg and I chattering about everything and anything except the hard stuff. We left life's troubles in the tackle box on this day. It was the kind of day I will be looking to repeat very soon. Going to make a point of it to spend more time struggling with casting a 10' ugly stick, in a 20mph cross wind, with a blue crab stuck on a #15 circle hook on the end of a 5' leader anchored by a 6oz spider weight instead of struggling to real in another order at work. We took some video and after a quick edit or two here was how they day went. I don't know what the heck happened to the audio on this next video. I've got too many gadgets and file formats to figure out. If you listen hard enough you can hear the relaxation taking place. Recommend you attend to your hobby very soon and regularly. Do it with someone you like hanging out with. That's what I did. It works.